Dozens of people attended the Simplified Process Mapping webcasts we conducted in early August so Harvard Computing Group is planning two additional presentations in the next several weeks. 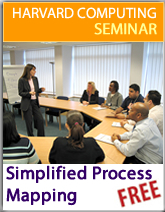 These one-hour seminars describe the challenges associated with capturing process knowledge and producing good process maps. You will learn about a simple, yet effective technique for understanding and documenting work processes. You will also see several examples of process maps created with Harvard Computing Group’s TaskMap add-in for Visio. September 8th at 2:00 PM US Eastern Time. If you have questions about these events, please contact Harvard Computing Group at +1 978-800-4590 option 7 or info@taskmap.com. You can register for this webcast by visiting our training calendar and selecting your preferred date.